Honoring 10% discounts to all Knights of Columbus members! Rosaries by Frank is your premier source for rosary necklaces and bracelets for all occasions. We offer customizations and a variety of styles and materials to create a unique rosary for you or your loved one. We also specialize in restoration and repair of your favorite rosaries, to breathe beauty back into heirlooms and sentimental pieces. Customers throughout the region rely on Rosaries by Frank to provide them with beautiful, custom rosaries. Whether you’re giving one as a gift for a special occasion or replacing a set of beads from long ago, we offer the personalized touches you’re looking for. Choose gemstones of different colors, centerpieces of your favorite saint and several styles of wood or metals! We work with all types of materials—including pewter, nickel and silver—to craft the perfect custom rosary in Phoenix, AZ for our customers. Request a rosary, bracelet or other prayer beads in Phoenix, AZ and we will make exactly what you want, guaranteed. Design a future family heirloom for yourself or give a lovely first communion or confirmation gift. In addition to creating and selling unique religious mementos, Rosaries by Frank also specializes in the repair and restoration of rosaries. Bring your aged rosary in Phoenix, AZ to our shop to make it look like new again. We use precision processes to complete detailed repairs that produce impeccable results. In fact, our work has earned us wide-ranging praise and an A-plus rating with the Better Business Bureau (BBB)! 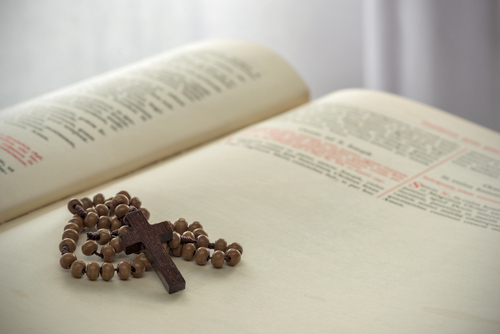 We invite you to contact us today to place an order or receive a quote on a custom rosary. We promise you’ll love the unique, intricately-detailed piece you’ll get from us. We specialize in both the creation and repairs of rosaries. We maintain an A-plus accreditation through the Better Business Bureau (BBB). We offer custom rosaries featuring the style and materials of your choosing. Our business is locally-owned and –operated, and we’re an established member of the local Knights of Columbus chapter. We offer free estimates on all of our products and services. When you want personalized service and customized orders, contact Rosaries by Frank to meet all your needs. We delivery nothing less than beautiful results, no matter what. "Outstanding quality, and a bargain like no other, Thanks"
"I had Frank make me 3 special rosaries all made within my budget and i was thoroughly pleased beyond words. He WILL get all my future busine..."
"has done repair work on my Rosary and it looks great. He stands behind his work."